This might be the coolest thing McDonald's has ever done (other than Pokémon Happy Meal toys). At certain McDonald's locations, diners can use a paper placemat called a McTrax to actually play and record music. So how exactly does it work? A super-thin circuit board inside the sheet of paper is placed onto a standard fast-food tray. As long as the diner has a smartphone, they can download the app that syncs up via Bluetooth to the various touchpoints on the placemat. The placemat will even record your voice, as long as you're brave enough to start singing in the middle of your meal. Right now you can only find these guys in the Netherlands, but we're hoping McTrax will make it to North America soon. Check out the video below to see McTrax in action! 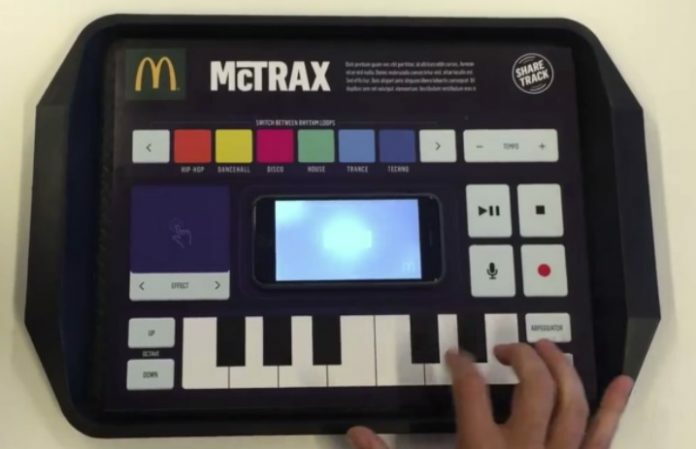 Would you drop a beat in the middle of McDonald's? Should they bring these to the U.S.? Let us know in the comments.